Beyond our front doors awaits an escape that will soothe and refresh your spirit. Scottsdale?? 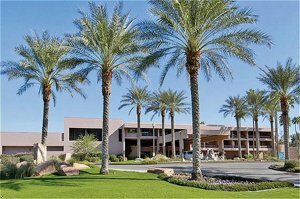 ?s only lakeside boutique resort, the Millennium McCormick Ranch offers a relaxing and intimate atmosphere just three miles from Old Town Scottsdale and surrounded by world-class golf and breathtaking views of the Camelback Mountains. Unwind in our 125 Southwestern-style guest rooms and suites, all with balconies or patios, or in one of our 50 private two and three bedroom villas featuring fireplaces and spacious living areas. Enjoy fine dining at the Pi? ?on Grill or a casual, inviting atmosphere at Diamondbacks Lounge or at our poolside cabana. The casual, intimate surroundings of Diamondbacks Bar & Grill affords a comfortable setting to enjoy lighter fare for lunch or dinner.Savor a poolside sunset while you sip our signature Prickly Pear Margarita at our Cool Coyote Cabana Bar.